Ghost is a new open source blogging platform that hopes to soon put a spoke in the wheels of WordPress, Tumblr, Joomla and so on. Launched as a Kickstarter project just a couple of months ago, Ghost had to reach 25,000 $ to be funded but on the last day of funding the gig had already collected 298,000 $. But what makes this project so special? First of all, it is supervised by John O'Nolan. The designer is already well known for having worked on WordPress. A real guarantee when it comes to the online publishing scene, in fact, under his advice WordPress has gone from a simple CMS platform to a mastodontic engine that powers more than 18% of the web. O'Nolan will also provide a hosting service to those who choose Ghost as a blogging platform. "Ghost is a non-profit project. If successfully funded, Ghost will be legally registered as a not-for-profit organisation. Why should you care? It means that no one owns shares of monetary value in the project. 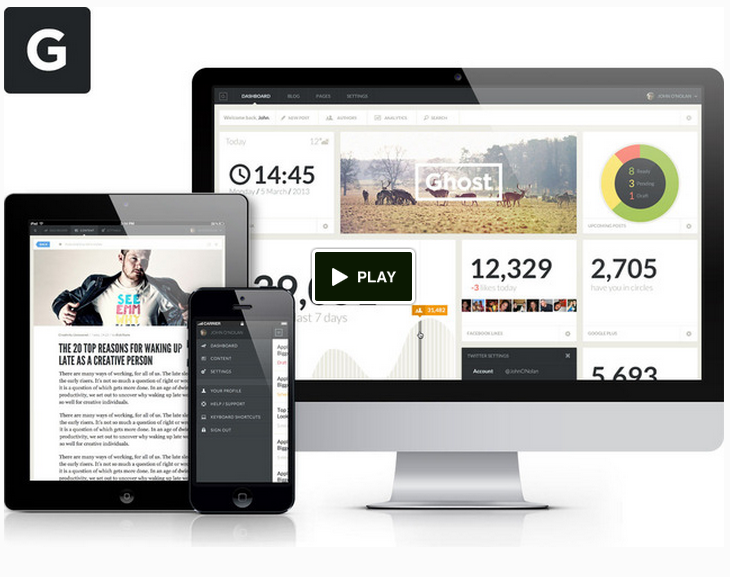 We're building Ghost because we want online publishing to be better. We want to make decisions focused on that goal, not on building a startup that we can sell to Facebook for $1billion. Being a non-profit means that any money Ghost makes can only ever be used to re-invest in making Ghost better. Not making shareholders rich. We're setting up world-class hosted platform that allows you to set up a new Ghost blog in just a couple of clicks." In what way will Ghost be innovative compared to WordPress? If you look at the video below you will realize that the differences between WordPress and Ghost are significant. If you have ever blogged with Wordpress, I'm sure that you, like me, have realized that something was missing. Watching Ghost I finally discovered what's missing in WordPress: a real time preview. Imagine being able to write an article and to have right on your side the web preview of that article, which is updated in real time. But Ghost's innovation are not limited to this feature. Ghost can also show-off a dashboard much more social and compatible with mobile devices, a feature that WordPress couldn't even dream about right now. Of course we will update you as soon as we have more information about Ghost. It will take at least 1 or 2 years of break-in before you can really see how competitors, especially since the plugins and themes have yet to be developed or ported. UPDATE: Ghost has launched publicly http://blog.ghost.org/public-launch/.